The reaction most people have when you point out people are naive enough to post pictures of credit and debit cards online is to laugh, surely no one could be that unaware of the risks. But the fact is that the situation has become that common place that a number of Twitter accounts have been set-up to automatically identify and repost the images. Some, like @CancelThatCard/http://cancelthat.cc/ attempt to show the posters the error of their ways, while others merely highlight the posts and request that people “Please quit posting pictures of your debit cards”. Yes, people do post their cards online…..
As a side note, it looks like Twitter is stamping down on the practice of highlighting these posts, the last message posted by @cancel thatcard on April 14th indicate that the service has essentially been censored. I hope Twitter reverse this, providing security information to end-users is not something that should be prevented. I’ve been following both accounts for sometime; at first my reaction to that I’ve discussed above, having a laugh at the expense of those who don’t recognise the security implications of their actions. As time went by I started messaging the accounts posting their cards to further highlight the error; this didn’t have the impact I was expecting, instead of thanks for providing free advice it more regularly resulted in insults, abuse and full denial that there was any risk imposed. Recently I came across an image of a card where the owner had attempted to obscure part of the card number and name; smart. 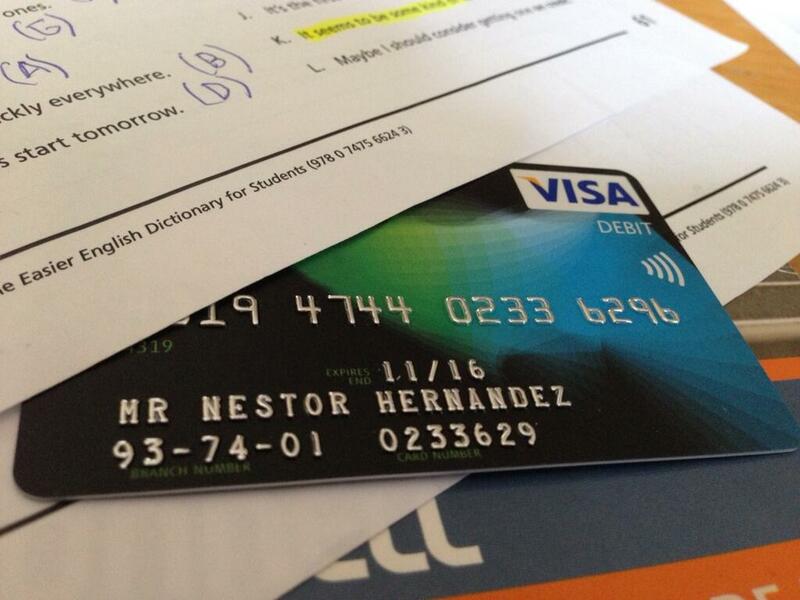 Not so smart was that it was the first 5 digits of the 16 digit card number that was obscured. It’s little known, and wasn’t to me until I started following these cards in more depth, is that the first 6 digits don’t identify the account or card holder, but the bank that issued the card. In this case the poster was so helpful to identify the card as a personalised BarclayCard. A quick Google search lead to this page, which knowing the 6th digit of the card lead to the fact that the missing digits could only be one of two possibilities, reducing the potential entropy gained from obscuring part of the card from ~10k possible numbers to two possible card numbers, effectively posting the entire 16 digits online. In the above example, which is far from uncommon, when suggesting the owner may want to remove the image and cancel the card the response was one of confusion, with no understanding of the risk. Despite further information and links, the image is still online (I have no way of knowing if the card has been cancelled). To end I’ll echo the plea from @needadebit card: Please quit posting pictures of your cards people. P.S. I’ve not identified any of the examples directly in this post, but I’ve also not cleared any of the conversations from my Twitter time-line if anyone is interested enough to search. If people post pictures of their account details online, and then don’t remove the same information once several people highlight the stupidity then, well, me deleting a couple of Twitter posts aren’t going to improve their security. 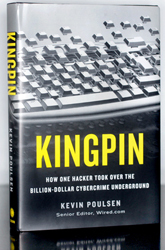 Written by journalist Kevin Poulsen (of wired.coms Threat Level blog), KingPin spans the hacking, cracking and carding underworld spread over several decades. The narrative covers the life and activities of Max Vision, a computer consultant, key member of the carding underworld and ultimately convicted criminal. From the timescales involved, kingpin covers many years and several of Max’s ‘projects’ made national headlines at the time. Some, like the Pentagon being hacked via a weakness in BIND were folklore by the time I personally entered the infosec profession. While others, like the ongoing wars and takedowns between various carder forums were more recent and featured heavily in the press at the time. The part of the book that I found fascinating throughout was that I was unaware that many of these, on the surface, unconnected stories were linked to the same individual; plus several more on the legal/whitehat side of the community, some of which I have used and experimented with prior to reading Kingpin, it’s usually interesting to get some of the backstory behind tools in this industry, but it’s especially the case with this backstory. Equally, I found the portrayal of Max’ early years to be intriguing, reading Kingpin I had the feeling (rightly or wrongly), that the outcome of the story could have been different had a couple of actions and/decisions gone the other way, leaving Max as an asset to the infosec community rather than running one of the largest criminal forums on the net. Can’t help wondering if Max could have ended up being a positive force in the infosec community, or if those that are could have ended up going the same route had circumstances been slightly different. From the right side of the law, I was fascinated with the details of Special Agent Mularski’s undercover work as Master Splyntr. Like a lot of the content of the book I was familiar with the impact Splyntr had had within carding community from several press articles at the time, but hadn’t dug in too much depth. Knowing more about the time and dedication required by one man that ultimately lead to many arrests I’d like to make an offer to Agent Mularski: if we’re ever in the same place, introduce yourself and the drinks are on me (and hopefully the war-stories are on you). If you’ve got any interest in information security or crime in general, I’d strongly recommend that you put a few hours aside read Kingpin. If you’re disappointed after you finish I’ll be surprised.